Holiday Wednesday Jan 30th Due to extreme low temperature on Wednesday, all Summit classes have been cancelled. Aim Academics also wont be conducting classes tomorrow. We will provide a make up class, the following Saturday or Wednesday. Please send us an email, and let us know, on which day you would like to makeup, so we can forward your email to the respective teacher. STAY WARM and SAFE! Holiday Saturday Dec 1st Summit has Santa Breakfast this Saturday Morning. We are open all other Saturdays this month. Since there are 5 Saturdays this month, there is no need for make up class. Holiday Wednesday Dec 5th Summit Christmas Tree Lighting Shutdown. Since there are three Wednesdays open this month, we will provide a make up class. Please send us an email, which day is convenient for you so we can forward the message to the teacher. Public Speaking Competition: We will be hosting public speaking competition in December one of the Wednesdays or Saturdays. Parents are welcome to attend. We currently have some students enrolled. It will be on any current topic of interest. If you are interested please contact us. Holiday Oct 31st - Halloween Since there are 5 Wednesdays this month, there is no need for make up class. Holiday Sep 1st Labor day Weekend! Since there are 5 Saturdays this month, there is no need for make up class. Holiday Sep 5th Summit Annual Shut Down week. Since there are 3 Wednesdays this month, we will provide a make up class following Saturday or Wednesday class. Please send us an email and let us know which day is convenient for you. Holiday Wednesday August 15th5 Wednesdays skip day!!!! Since we have 5 Wednesdays this month. We have holiday this day. No need for a make up class as we are open all other Wednesdays and Saturdays.! 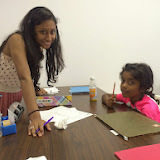 New SAT batch is starting on Saturday August 25 th at 9:30 AM at CANTON location. Register online to receive discount. TAG Preparation Workshop: 2018 TAG (Talented and Gifted) Screening Test Preparation classes are starting soon. If you are interested in this workshop please send us an email and let us know. Holiday Wednesday July 4th and Saturday July 7th Independence Day!!!! Summit is closed on Wednesday. Make up class is provided on the following Wednesday. Thank you! 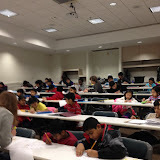 New SAT batch is starting on Saturday June 23rd at 9:30 AM at CANTON location. Register online to receive discount. Holiday Saturday June 16th Since there are 5 Saturdays this month, we have a holiday this day. There is no need for a make up class. We are open all other Wednesdays and Saturdays this month. Summer 2018: Kids could lose two months of learning during summer. Aim Academics can help students avoid summer brain drain. Couple of hours per week during summer break can help. Sign up for more sessions as we are also offering exciting discounts at this time. If you are interested please contact us. Holiday Wednesday May 16th Since there are 5 Wednesdays this month, we have a holiday this day. There is no need for a make up class. We are open all other Wednesdays and Saturdays this month. Holiday Saturday April 28th Summit PDC room is unavailable. We will provide a make up class next Wednesday or Saturday. Please email us and let us know which day you would like to make up the class and we will forward your message to the respective teacher. Referral Programs for current students: To thank our current students, AIM4A will give a $25 credit for each new referral. Just have your friends or referral mention you when they register. We will issue you a $25 credit toward your payment for this month or next month. A new referral is a student who registers and pays for AIm4A sessions for the first time. Holiday Saturday March 31th Long Weekend - Good Friday Holiday: Since many students are going out of town this Saturday, we are having a holiday on Saturday March 31st. We will provide a make up class. Please email us which day you would like to make up the class and will forward the message to the respective teacher. Holiday Saturday March 24th Summit PDC room not available. Since there are 5 Saturdays this month, there is no need for a make up class. We are open all other Wednesdays and Saturdays this month. Holiday Jan 17th Since there are 5 Wednesdays this month, we have a holiday this day. There is no need for a make up class. We are open all other Wednesdays and Saturdays this month. Holiday Dec 2nd Since there are 5 Saturdays this month, we have a holiday this day. There is no need for a make up class. We are open all other Wednesdays and Saturdays this month. Thanksgiving Holidays: Wed Nov 22nd and Saturday Nov 25th Since there are 5 Wednesdays this month, there is no need for make up class. Saturday students please send us a email and let us know which day you would like to make up the class. Thank you. 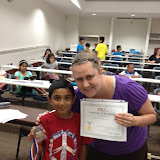 Awards: This month we have two students who are doing very well, two levels above their grade level. We would like to congratulate them and award them with trophies. Holiday Saturday, Sep 2nd Since there are 5 Saturdays this month, we have a holiday this day. There is no need for a make up class. Holiday Wednesday, Sep 6th Summit has annual maintenance shutdown this week. Since there are 3 Wednesdays this month, we will provide a make up class on Saturday. Please email us and let us know which Saturday is convenient for you and we will forward the email to the respective teachers. Holiday Wednesday, August 16th Since there are 5 Wednesdays this month, we have a holiday this day. There is no need for a make up class. We are open all other Wednesdays and Saturdays this month. Holiday Saturday, July 1st Since there are 5 Saturdays this month, we have a holiday this day. There is no need for a make up class. We are open all other Wednesdays and Saturdays this month. Holiday Wed, May 17th Since there are 5 Wednesdays this month, we have a holiday this day. There is no need for a make up class. We are open all other Wednesdays and Saturdays this month. Congratulations to all of these students! 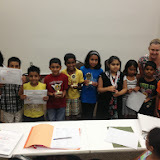 We will do the award ceremony is the classroom one of the days Wed and Saturday and upload the pictures soon! If we missed mentioning any student who received an award, please email us. Holiday Sat, April 1st Since there are 5 Saturdays this month, we have a holiday this day. There is no need for a make up class. We are open all other Wednesdays and Saturdays this month. Holiday Wed, Mar 15th Since there are 5 Wednesdays this month, we have a holiday this day. There is no need for a make up class. We are open all other Wednesdays and Saturdays this month. Holiday Sat, Nov 23rd Since there are 5 Wednesdays this month, we have a holiday this day. There is no need for a make up class. We are open all other Wednesdays and Saturdays this month. TAG Preparation Workshop: 2016 TAG (Talented and Gifted) Screening Test Preparation classes are starting on Saturday, October 7, 2016 at 10:30 AM. Sign up online to receive advance registration discount. Holiday Sat, Oct 15th Since there are 5 Saturdays this month, we have a holiday this day. There is no need for a make up class. We are open all other Wednesdays and Saturdays this month. TAG Preparation Workshop: 2016 TAG (Talented and Gifted) Screening Test Preparation classes are starting on Saturday, October 1, 2016 at 10:30 AM. Sign up online to receive advance registration discount. Holiday Wed, Aug 17th Since there are 5 Wednesdays this month, we have a holiday this day. There is no need for a make up class. We are open all other Wednesdays and Saturdays this month. Aim Academics Facebook Page: Please check https://www.facebook.com/aim.academics. Holiday Sat, April 16th Since there are 5 Saturdays this month, we have a holiday this day. There is no need for a make up class. We are open all other Wednesdays and Saturdays this month. Holiday Sat, March 5th Summit has Home Expo and the building is closed for all the classes. We have holiday this day. We will provide a make up class on Wednesday. For SAT batch students , the course is extended by another week. Special Promotion for existing students: Aim4A is offering the special promotion for current students only of $120 per month ($240 Value) for unlimited Math or English classes upto 16 hours per month. Mention this promotion and get the offer. No makeup for missed classes and no other discounts apply. Holiday Sat, Jan 23rd Since there are 5 Saturdays this month we have a holiday this day. We are open all other days so need for a make up class. Holiday Wed, Dec 2nd - Summit Shut down for Tree Lighting Since there are 5 Wed this month there is no need for make up class. TAG Preparation Workshop: 2014 TAG (Talented and Gifted) Screening Test Preparation classes are starting on Saturday, September 19, 2015 at 10:30 AM. Sign up online to receive advance registration discount. Holiday Wednesday, December 24th & 31st, 2014 Summit is not available, So AIM4A has holiday this Wednesday. We will provide a make up class, so please email us the day/time you would like to make up and we will forward your message to the respective teacher. We are open all Saturdays this month. Holiday Wednesday, December 3rd, 2014 Summit is closed this day due to Tree Lighting Decoration Event, So AIM4A has holiday this Wednesday. We will provide a make up class, so please email us the day/time you would like to make up and we will forward your message to the respective teacher. We are open all Saturdays this month. 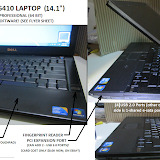 EXTREMELY IDEAL: Compact & Powerful DELL 13.3 Business Laptop for sale!!!!! See the attachments for costs, specs, pictures and many bonus extras. 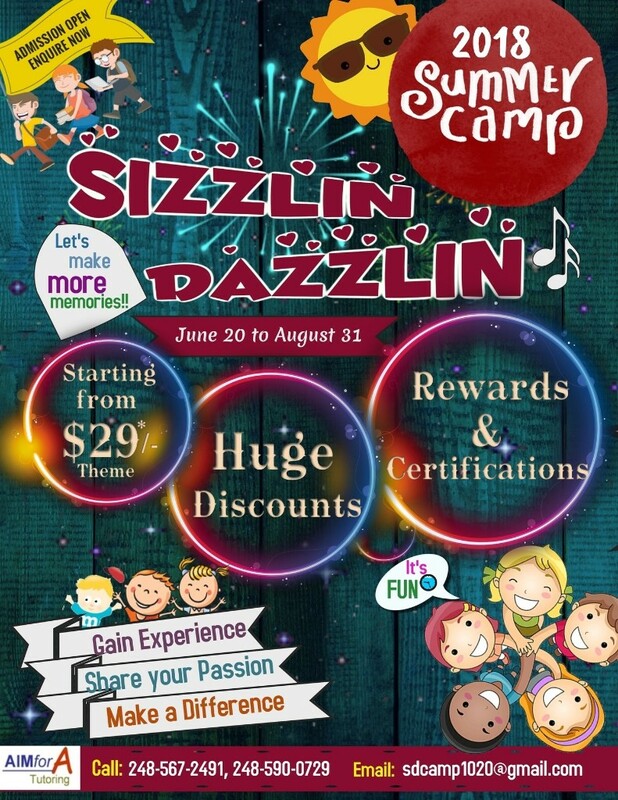 The parent can meet if anyone is interested during AIM4A class time at the Summiit. Holiday Saturday, November 29, 2014 - Thanksgiving Weekend: Summit is closed this day due to Thanksgiving break, So AIM4A has holiday this Saturday. We are open all other Saturdays. Since there are 5 Saturdays this month, there is no need for a make up class. Holiday Wednesday, October 29, 2014 Summit is closed this day due to Trick or Treat Community event. So AIM4A has holiday this Wednesday. We are open all other Wednesdays so no need for a make up class. TAG Preparation Classes: 2014 TAG (Talented and Gifted) Screening Test Preparation classes are starting on Saturday, September 27, 2014 at 9:30 AM. Sign up online to receive advance registration discount. Referral Programs for current students: To thank our current students, AIM4A will give a $50 credit for each new referral. Just have your friends or referral mention you when they register. We will issue you a $50 credit toward your payment for this month or next month. 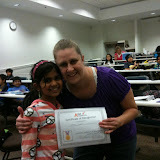 A new referral is a student who registers and pays for AIm4A sessions for the first time. Holiday Wed Sept 3rd, 2014 Summit is closed this week for annual maintenance and will reopen on Saturday. So AIM4A has holiday on Wednesday. We are open all other days and will provide a make up for this class. Please send us an email with which day and time you would like to make up and we will forward your message to the respective teacher. Holiday Sat Aug 16th, 2014 Since there are 5 Saturdays this month, AIM4A has a holiday on Aug 16th 2014. Holiday Wed July 16th, 2014 Since there are 5 Wednesdays this month, AIM4A has a holiday on July 16th 2014. Holiday Sat, July 5, 2014 Due to July 4th holiday, many students and tutors are on vacation. So, we will have a holiday on July 5th. Saturday students may make up any missed classes on another Saturday or Wednesday. Holiday Wednesday, December 25th 2013 CHRISTMAS: AIM4A has holiday on Dec 25 for Christmas. Since there are 3 wednesdays this month we will provide make up clas. Please send us an email with the make up date and will forward your message to the teacher. Holiday Wednesday, January 1st 2014 New Years day - Since there are 5 Saturdays this month, AIM4A has a holiday on Saturday, Nov 16. We are open all other Wednesdays and Saturdays this month. Student Awards The following students received certificates, medals and trophies for their accomplishments and/or completion of a curriculum. CONGRATULATIONS TO YOU ALL!!! TAG Preparation Workshop: TAG (Talented and Gifted) Screening Test Preparation workshop is starting on Saturday Sept 21st at 9:30 AM. Sign up online to receive advance registration discount. Congratulations to all of these students! Pictures will be uploaded soon! If we missed mentioning any student who received an award, please email us. TAG Preparation Classes: TAG (Talented and Gifted) Screening Test Preparation classes are starting on Saturday Sept 21st at 9:30 AM. Sign up online to receive advance registration discount. As usual please read our Important center Policies. No drawings on the tables. If any drawings are found the student/parent will be charged the cleaning fees $100 to your account. Summit charges $400 for excessive cleaning and will be charged to the parents. We notified the teachers and students in the classes. Parents please talk to your students as well so they are aware. No running around the halls. Parent/guardian is responsible for the behavior of their child in the classroom and on the premises. Parents should instruct students not to leave the premises without a parent or guardian. Our tutors and staff cannot monitor the students once they leave the classroom. Parents should be at or near the premises and must pick up their students promptly when the class ends or in case there is an emergency. To avoid disturbance to the classes, parents are requested to communicate with tutors or center manager via CMS or Email for any changes, questions, or feedback. Any extra, unusual or special request will be accommodated subject to $30 per hour fee. Congratulations to all of these students! 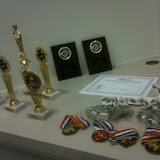 Awards will be given soon and the pictures will be uploaded! If we missed mentioning any student who received an award, please email us. Congratulations to all of these students! The pictures will be uploaded ! If we missed mentioning any student who received an award, please email us. Holiday Saturday, April 13 2013 Summit is not available this day so AIM4A has a holiday on April 13th, 2013. Since there are 3 Saturdays this month, we will provide a make up class. Please send us a quick email with the date and time you are available for make up class so we can forward your message to the respective teacher. Congratulations to all of these students! The pictures will be uploaded! If we missed mentioning any student who received an award, please email us. Holiday Saturday, March 2nd 2013 Summit has Home Expo and the whole building is closed for classes. So March 2nd is a holiday for Math and English group classes. We are open all other Saturdays(March 9,16,23,30). Since there are 5 Saturdays this month, there is no make up class for March 2nd. ACT classes will be scheduled as usual at the Livonia Location at the same time. This Saturday (March 2) will be the ACT instruction class before Tuesday's MME. We will be covering geometry, trigonometry, and essay. CMS - Center Management System It has come to our attention that not many parents are aware of our CMS - Center Management System that keeps track of the students progress. Parents please login in periodically to your childs account to see the progress. If you forgot your password please email us and will be happy to forward it to you. Saturdays: February 2nd and February 16: Summit Building is not available these two days for maintenance purpose. Aim Academics will be relocating to our Livonia location for these two days. All the group classes will be conducted these two Saturdays at our Livonia location. ACT students please check with your teacher for the Schedule. Congratulations to all of these students! If we missed mentioning any student who received an award, please email us. Aim4A wishes its students and parents a very happy and prosperous new year! Holiday on Saturday January 5th, 2013: Since Summit is not available, Aim4A will have a holiday on Jan 5th. We are open all 5 Wednesdays. Since there are only 3 Saturdays we will provide a make up class. Please send us an email with the make up class date and time and we will forward it to the teachers. Holiday on Saturday December 22nd, 2012: Since there are 5 Saturdays this month, there is no make up session. Holiday on Wednesday December 26th, 2012: Since there are 3 Wednesdays this month, there is a make up session in January 2013. We are open all 5 Wednesdays in Jan 2013. No drawings on the tables. If any drawings are found the student/parent will be charged the cleaning fees. TAG Phase I Course Completed: The last class for TAG Phase I course was on Wed, Dec 19th. 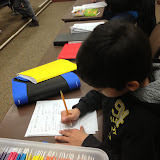 Students also received extra worksheets for Non-verbal Reasoning which they should complete at home. If parents have any questions regarding any of the course worksheets, please send us an email by Dec 26th. We will try to answer the questions through email -- or, if needed, we will arrange a time with the instructors to go over the answers. To get the most out of the course, parents should ask their children to review all the worksheets one more time and do any missing work. Good luck to the students with their TAG test. Fees Increase: Due to increase costs the fees have gone up. Please see the http://canton.aim4a.com/index.php. Students taking a break, parents need to email and give us 30 days notice to make the changes. Holiday on Wednesday, October 31st, 2012: Oct 31 is Halloween, so AIM4A has holiday, Since there are 5 Wednesdays this month, there is no make up session. Congratulations to all of these students! Click on the picture link below to view the pictures! If we missed mentioning any student who received an award, please email us. TAG Preparation Classes: TAG (Talented and Gifted) Screening Test Preparation classes are starting on Saturday Sept 22nd at 9:30 AM or Wednesday Sept 26th at 6:30 PM depends on the teachers availability. Sign up online to receive advance registration discount. Holiday on Wednesday, August 29th, 2012: Summit is closed due to annual maintenance so August 29th is a holiday. Since there are 5 Wednesdays this month, there is no make up session. Holiday on Saturday, August 25th, 2012: Summit is not available so AIM4A have holiday on Aug 25th. Make up class is September Sep 1st. We are open all 5 Saturdays in September. Make up class Policy: Please see our policy on the website. Please plan to stick with your class schedule. If you miss a private class and your tutor shows up, you will not get a make-up class. For group classes, there is no make up but you may make up at another group class only if you had a good reason to miss your scheduled class. Holiday on Wednesday, July 4th, 2012: July 4th - Independence day holiday. Since there are 3 Wednesdays this month, we will provide make up class. Wednesday students please email us and let us know which day/time you would like to make up the class and we will forward your message to the teachers. Holiday on Saturday, June 16th, 2012: Summit has Liberty Feast so AIM4A will have holiday on Saturday June 16th. Since there are 5 Saturdays this month, there is no make up class. Congratulations to all of these students! The pictures will be posted soon! If we missed mentioning any student who received an award, please email us. Holiday on Saturday, May 12, 2012: Summit has Health Expo so AIM4A will have holiday on Saturday May 12. Since there are 3 Saturdays this month, we will provide make up class. Saturday students please email us and let us know which day/time you would like to make up the class and we will forward your message to the teachers. Holiday on Wednesday, February 15th, 2012: Aim4A will have holiday on February 15th, 2012. Since there are 5 Wednesdays this month, there is no make up class. Holiday on Saturday, March 3rd, 2012: Summit has Home Expo on March 3rd so AIM4A will have holiday on Saturday. Since there are 5 Saturdays this month, there is no make up class. Study Skills Workshop starting April 6th, 2012: New batch for study skills workshop is starting on April 6th at the Northville location. If you would like to register click here. This workshop is free to our current enrolled students. This workshop is to help students improve study skills. The workshop is primarily aimed at middle and high school students, but advanced students in elementary grades may also benefit from it. Parents are encouraged to attend the workshop along with the students. The workshop consists of instruction, in-class drills, and homework. Students are required to bring a laptop computer to the class in order to work on the drills. Answer tags for Middle/High School Math Worksheets: Answer tags for worksheets for middle/high school math students are available when you login to students dashboard in the CMS. All other students must check the answers to the worksheets by login into their CMS account. Videos are available if If you would like to get more info, please check CMS Overview, Finding answers to worksheets, Math, English and Review Worksheet. 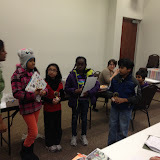 Recommended classes: Aim4A recommends 2 classes per week/subject that is 8 classes/month. Students who are signed up for 4 classes per month progress through the curriculum at a slower pace so it might take longer to complete the curriculum. Please check with the center if you would like to make any changes. Please note that AIM Academics is open on Saturday Dec 17th in Arts 2 classroom instead of PDC room. Answer tags for Middle/High School Math Worksheets: Answer tags for worksheets for middle/high school math students are available when you login to students dashboard in the CMS. All other students can also check the answers to the worksheets by login into their CMS account. If you would like to get more info, please check the videos on CMS Overview, Finding answers to worksheets, Math, English and Review Worksheet. 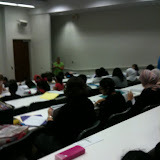 Study Skills Workshop: This workshop is to help students improve study skills. The workshop is primarily aimed at middle and high school students, but advanced students in elementary grades may also benefit from it. Parents are encouraged to attend the workshop along with the students. 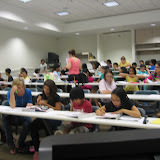 The workshop consists of instruction, in-class drills, and homework. Students are required to bring a laptop computer to the class in order to work on the drills. Review Tests and Progress in CMS: To ensure that students are making progress, there will be review tests at the end of most of the topics in the curriculums. Parents are requested to use the answer key provided to score the tests. If the test results are unsatisfactory, parents should ask the student to review the chapters preceding the review test. If the parent thinks that the student should repeat those chapters, they should send a note to the instructor via email or through CMS Student Dashboard. 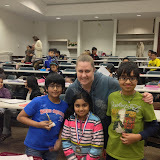 Awards are given to the students per completion of the final tests. Break Policy/Schedule Changes: These requests parents let us know via email at least a month ahead of time to make the changes. There is a one-time registration fee of $29.95 for all new and returning students. Students going on vacation can maintain enrollment and avoid registration fee when returning by paying one month fee in advance. Please see out Policies and Guidelines Page for details. TAG Preparation Classes: 2012 TAG (Talented and Gifted) Screening Test Preparation classes are starting on September 14, 2010 at 6:30 PM. Sign up online to receive advance registration discount. Congratulations to all of these students! Their pictures will be uploaded soon. If we missed mentioning any student who received an award, please email us. CONGRATULATIONS TO YOU ALL! If we missed mentioning any student, please email us. Review Tests and Progress in CMS: To ensure that students are making progress, there will be review tests at the end of most of the topics in the curriculums. Parents are requested to use the answer key provided to score the tests. If the test results are unsatisfactory, parents should ask the student to review the chapters preceding the review test. If the parent thinks that the student should repeat those chapters, they should send a note to the instructor via email or through CMS Student Dashboard. Student Awards The following students will receive certificates/medals for their accomplishments and/or completion of a curriculum. Their pictures will be uploaded soon. CONGRATULATIONS TO YOU ALL!!! Holiday on Saturday March 5, 2011: Summit is closed due to Building Home Expo, so AIM4A will have a holiday on Saturday, March 5th, 2011. The make up class is April 16th 2011. April has 5 Saturdays and we are open all 5 Saturdays. Our tutors, staff, and Summit staff cannot monitor the students once they leave the classroom. Parents should be at or near the premises and must pick up their students promptly when the class ends or in case there is an emergency. For older news, go to AIM4A Canton 2010 News. For older news, go to AIM4A Canton 2009 News. For older news, go to AIM4A Canton 2008 News.